The interior before we moved in, very little looks like this now. of the door, we removed it. Probably held a plastic screen in the early days. to keep prospective buyers from tripping over weird rock curb and then suing). And the style of architecture that I most liked and admired at that time was craftsman bungalow. I also had a particular affinity for Frank Lloyd Wright. Pottery Barn decor was rampant in Newport Beach in the early 2000's. Ruh-roh Raggie. What followed during the first seven years were some radical changes to the house. We added an office and laundry room, which weren't too bad. We modified the layout of the kitchen in the process of adding the office, which stuck a refrigerator in a horrible spot, kinda in the middle of a walk way (don't ask). 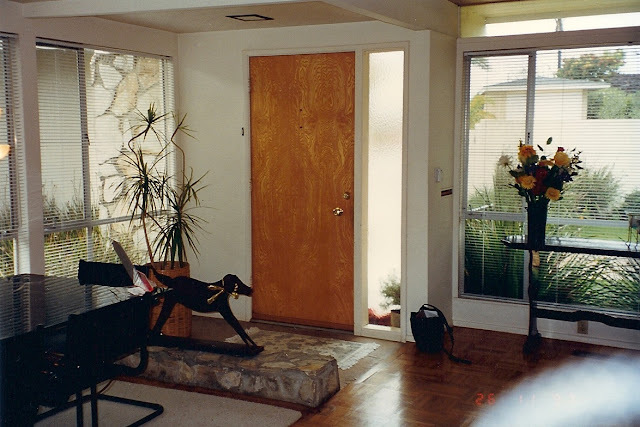 And, I am too embarrassed to show some of the other changes including really expensive Frank Lloyd Wright style wood windows, extensive use of craftsman bungalow interior colors (including a red bedroom), and a decorative tile border made up of art nouveau tiles from the early 1900's (huh?) purchased on eBay one tile at a time (click here to see a variety). OMG. 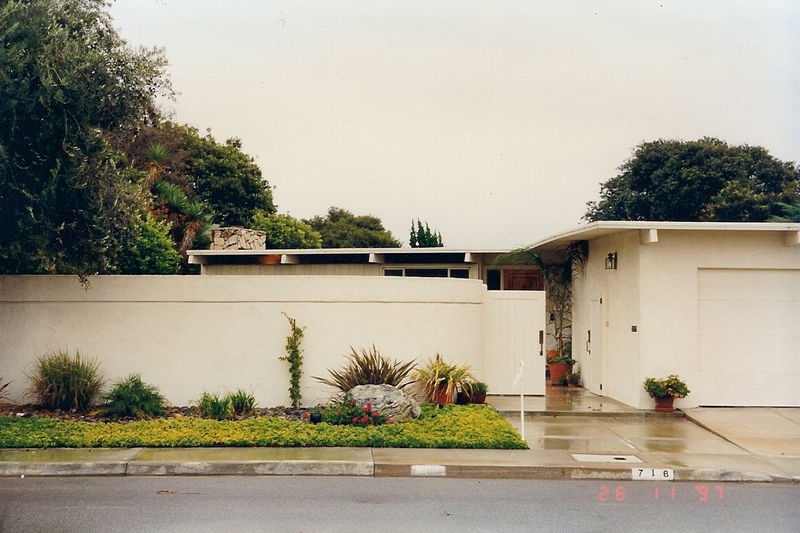 I am going to undo it all and bring the house back closer to its mid-century roots. So help me. I am now in the unfortunate cycle of remodeling where you go back and change all the things you changed previously. Albert is being a pretty good sport about the whole thing. I think he feels some culpability since he agreed to and helped fund the original changes. But I really know whose fault it was. In that vein, let's talk about the mantle. We added a mantle over the fireplace almost as soon as we moved in. The architect commented on it from the moment he walked through the door. And sent me photoshopped files more than once to prove we should not have a mantle. the dumb black cord hanging off the fireplace insert. I talked to Albert about the mantle approximately 137 times. Should we have a mantle? Is this something else I screwed up in the house? After considerable thought and rumination, I came to the conclusion I like having a mantle but not THAT mantle. The mantle we had was too fussy for the fireplace and the house. I went online and found a good idea at mantlesdirect.com. Click, click and a new mantle was in the mail. And voila! A contemporary mantle for a mid-century modern home. Looks good, huh? fireplace in white. One doesn't know what one is thinking sometimes. right is view of Little Corona. .
New contemporary wood mantle in better keeping with mid-century home. Although not period accurate, it blends reasonably well. By the way, the two beautiful plein air pictures over the mantle are by Jonathan Luczycki. He is an amazing artist, currently working out of Portland Oregon. We used to bump into him painting on Balboa Island. His paintings are affordable and the quality is high and he will by quite collectible one day. Should a Mid-Century Modern Have a Mantle?